Most women with fibroids should maintain a diet inclusive of meat protein like fish and chicken, some gynaecologists advise women to refrain from eating too many non-organic meat products, which could possibly lead to the worsening of uterine fibroids. It usually worsen with a high intake of pesticides and hormones which is mostly fed to poultry/chicken to make them grow fast for the seller to make more profit. If you eat the common fowl that eat natural feeds you don’t have a problem. It is when you have the chicken that they give the grower (food) and those things that have things inside there, it causes growth hormones, which in turn grow your fibroids. Fresh water fish, other meats such as beef, and granulated sugar also help to increase fibroids. NATURAL SOLUTION/REMEDY TO GET RID OF FIBROIDS WITHOUT SURGERY. Research into nature has discovered natural medicines that shrink, dissolve and eliminate fibroids without surgery and without negative side effect. The medicines are what forms our FIBROIDS SOLUTION KIT. 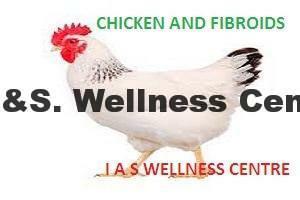 So, How Can I.A.& S. Wellness Centre Help Me Solve My Fibroids Problem? This entry was posted in Health articles, Health tips and tagged abdominal pain, chicken, female infertility, fibroids, hormonal imbalance, indigestion, inflammation.